Hypo-allergenic. A supremely effective carrier lotion formula utilising Peach Kernel oil and conditioning botanicals of Goldenrod and Rose Mallow to nourish, soothe and soften skin. 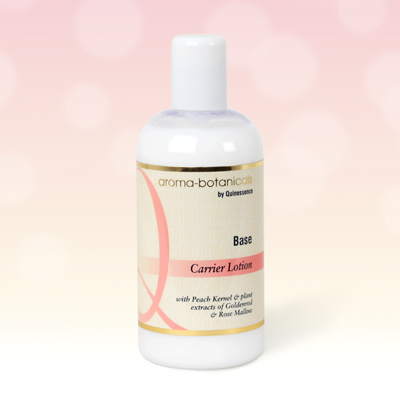 Rapidly absorbed and non-greasy, this versatile lotion can easily accomodate the addition of both essential oils and vegetable oils. Aqua, Glycerin, Stearic acid, Cetearyl alcohol, Caprylic/Capric triglyceride, Cetearyl ethylhexanoate, Cetyl acetate, Prunus persica, Simmondsia chinensis, Glyceryl polymethacrylate, Dimethicone, Malva arboreae, Solidago virgaurea, PPG-25-Laureth-25, Ceteareth-20, Sodium PCA, Triethanolamine, BHT, Lactic acid, Sorbic acid, Gluconolactone, Sodium benzoate, Calcium gluconate.